BGA Socket supports LTE femtocell SoCs. Extreme Temperature Socket accommodates 4 x 4 mm QFN device. 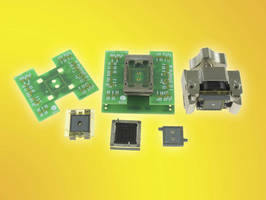 High-Performance BGA Socket accomodates 23 x 23 mm packages. Triple Stacked BGA Socket tests processor, memory, and memory probe. BGA Socket operates at bandwidths up to 8 GHz. High-Temperature BGA Socket has contactor with 500,000 cycle life. 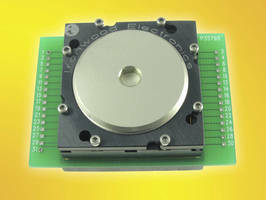 BGA Socket accommodates 0.4 mm pitch BG221. WLCSP Socket verifies IC function in development systems. 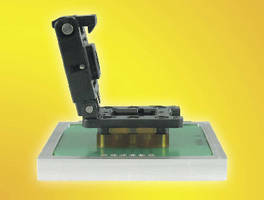 IC Test Adapter supports 0.8 mm pitch, 96-position BGA ICs. 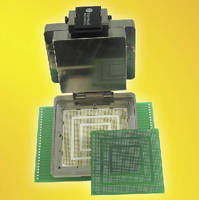 BGA Socket addresses burn-in characterization requirements.